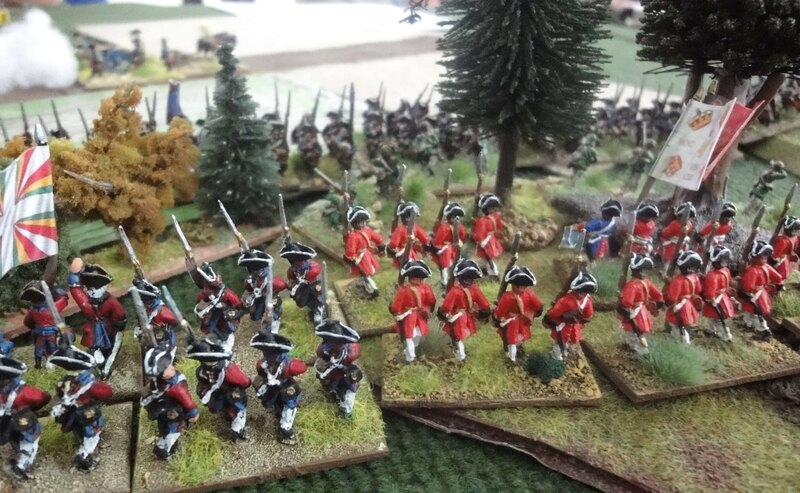 The Prussians approach the woods but the "Red" brigade can inflict more damage to them, firing from soft cover. Especially the battalion in front of the Chasseurs de Fischer takes four hits and has to retreat. The Royal Baviere can't take more and abandon the town! The French attempt to retake the village! The Prussian brigade east of the town is quite battered to advance. 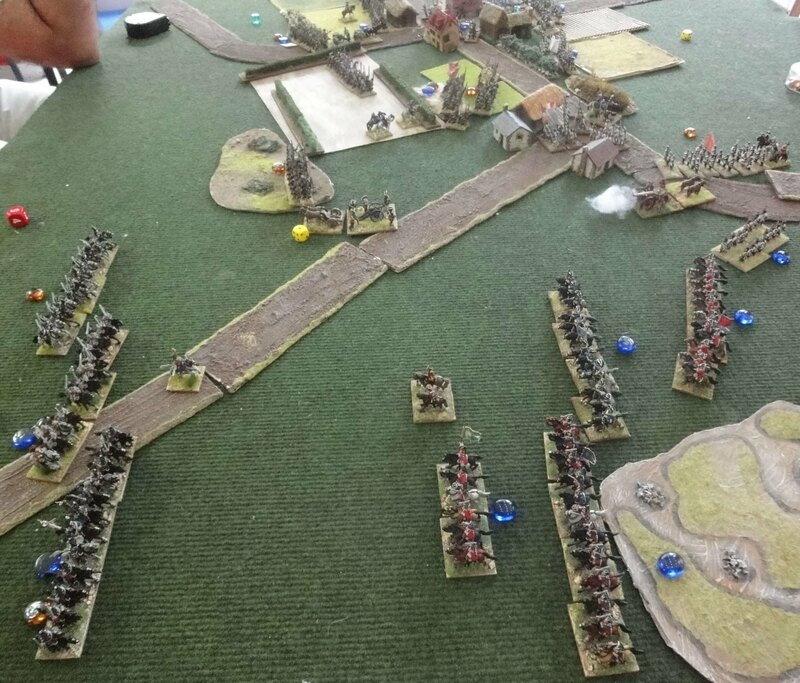 The Prussians take the town. 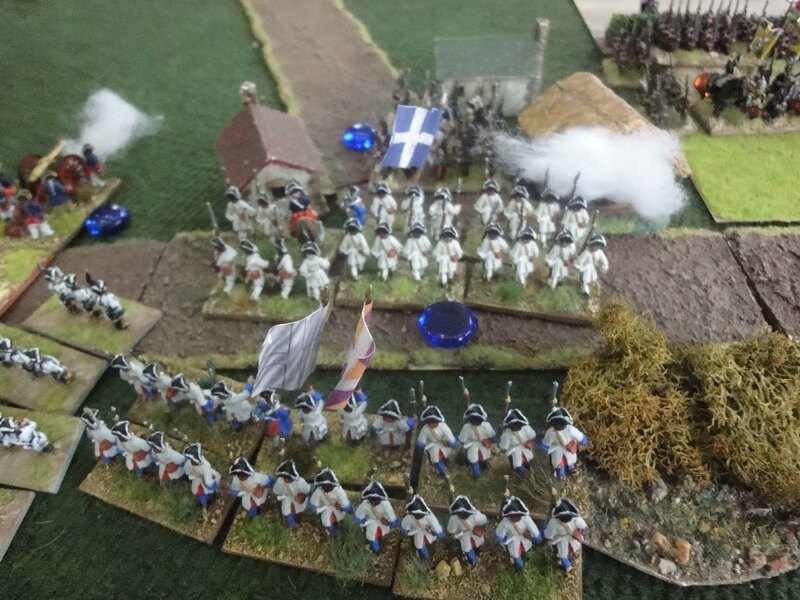 The French attack to retake the town from two sides! 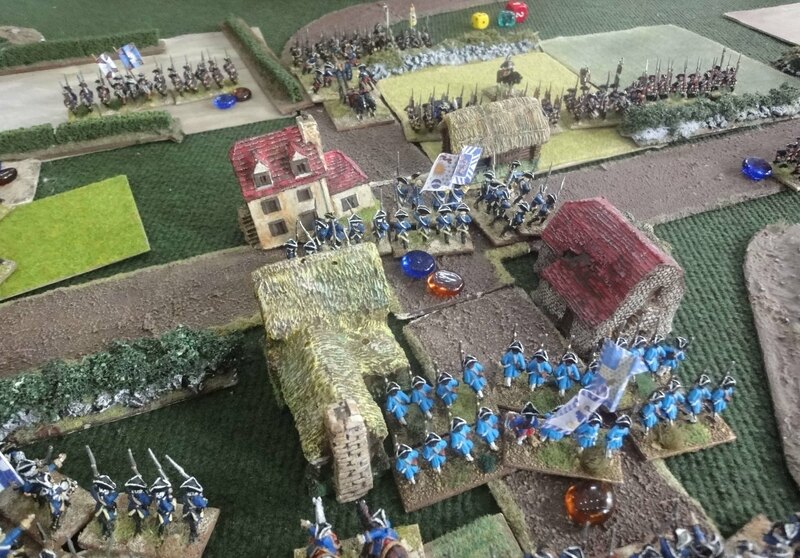 Not without blood, the French retake the town! ...and the town! The game is nearing its end. The last of the three regiments of the first Prussian cavalry brigade has left the table (brigade morale rules). ...push them to the edge of the table. Somewhere here we decided to call it a day. The Prussian cavalry had taken considerable losses. Village and town occupied by the French. The crossroads were taken. Dark was falling. The Prussians would have to make an orderly retreat. What a brave fighting. Congratulations! Vive le Roi! Great pictures and very detailed report as always. Those large battles are eye candy. Do you have German and Irish foreign regiments? I first decided to paint Irish only. But later I learned that sometimes Royal-Suédois was not in a german brigade. Therefore I will add this regiment to my collection. I have La Marck, Bentheim and ok, Royal-Suédois which I usually brigade them all together in non-historical games. I add also in their brigade the Royal Bavière Infanterie. Irish regiments Clare and Dillon, in non historical games I brigade them with my only Swiss Salis regiment. These are all my foreign regiments, for the moment I'm planning to make some more off-white clad French regiments and then, who knows, hopefully I'll be able to make some more foreign regiments. I dream to be able to have a Royal Ecossais battalion, mostly for a possible Jacobite scenario. Nevertheless you have a impressive collection. I would just change the carpet on the table. The figures are so beautifull and the carpet stands out somehow strange. Thank you! But it was only two big armies opposing one another. The carpets are remnants from the era that most people in the club was playing DBM and didn't mind much about the terrain. I know it is not so aesthetic and I promise with the first chance (and money available) to cover the ground with something more realistic and to improve the quality of the terrain items as well. La Victoire est a nous! Boy you don't do things by half do you? 17 battalions plus cavalry and artillery is your intro setup? Before this game Doc Vag was fearing that the different basing system may create a problem. I tried to convince him that it suffices the units to have the same total frontage. 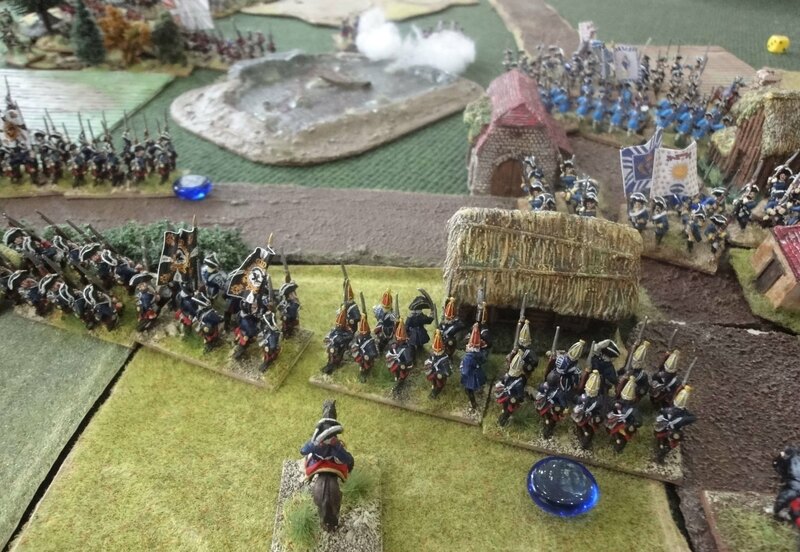 The different basing system in this game can be clearly seen if you take a look at the last picture posted (47), showing the Prussians in the foreground. Doc Vag's Prussians were based in 5cm base widths, but he was wise enough to create an additional small base of 2cm width. So, if we check the pic, we see two 5cm width bases plus one small 2cm width base, total 12cm unit frontage. My basing frontage of the French was 3x4cm = 12cm. Something similar with his cavalry, his 3 bases equalling in width my 4 bases. The flow of the game was perfect, no trouble with the movement and shooting distances.